A Huntsville lawyer recently reposted to LinkedIn an article by someone else titled 10 Common Motorcycle Accidents And How To Avoid Them. The attorney’s LinkedIn post simply contained the article with no additional insight. The article is interesting. Yet, how many motorcycle riders are going to consult a network of business professionals like LinkedIn before going on a ride? Not many (if any). If people are looking for tips on how to operate their bikes on the highway, they may consult a motorcycle professional or motorcycle publication. If the person consults LinkedIn’s business network it is probably after an accident — for professional advice on handling the injury claims process. At the Blackwell Law Firm, we have handled many motorcycle accident injury claims. Our law firm has a perspective that separates us from many other lawyers who advertise for personal injury claims. Our unique perspective helps us build these cases. What is our perspective that many other attorneys lack? We have real experience in the actual trial of motorcycle wreck cases. That gives us a unique perspective in a time when most lawyers who claim to handle personal injury work rarely, if ever, go to court for their clients. We have tried a number of these cases over the years (including this year) and have some thoughts based on our experience. Jury Bias. Real trial lawyers study issues of jury bias. Bias is an issue in many situations. Bias is natural. You need to prepare for potential biases if you really want to advocate for your client. Yet, many lawyers don’t prepare for widely-held biases. In the motorcycle context, many people are biased by images of motorcycles and motorcycle riders. We’ve all seen the TV images of outlaw bikers. Of course, these images are not representative of the vast majority of bikers. Most motorcycle riders are just like you and me. Many car drivers are also biased by a prior highway interaction with a motorcycle rider — maybe they almost hit a motorcyclist because they did not see him or her. 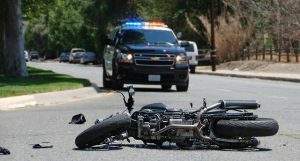 If you are hurt in a serious motorcycle accident, you need a lawyer with trial experience who understands the impact of jury bias on the process. This is essential to building the best case for an injured person. Complex Injuries. I’m not saying car accident injuries are simple. Car crash injuries can be complex. But, cars provide a big metal box around drivers and passengers. In our years of handling car accident claims, we’ve seen many serious injuries. We also understand the injuries that commonly occur. Because motorcycles offer little protection for the rider, certain injuries are more likely in those crashes. Fatalities are more likely. Head injuries are more likely. Serious neck/cervical injuries are more likely. Complex fractures are more likely. Our firm recently handled a motorcycle accident case involving a brachial plexus injury. Brachial plexus injuries occur when the nerves coming from the neck are stretched or pulled. They often occur in impacts to the head and shoulder (like what happens when a motorcyclist lands after being thrown from his or her bike). Visual Issues. How does the client appear? How does the motorcycle appear? If the bike looks like a racing bike, you have an image that may negatively affect the case. And, you need to prepare for it. Is there video and how does it appear? In recent years, we have seen an increasing number of cases with video evidence. Last year, we handled a wrongful death claim where the insurance company initially denied the claim. We were able to locate video of the event from a store along the highway which supported our client’s claim. We successfully resolved that case for our client. It’s not unusual to see accident video. Video can make or break a disputed claim. Of course, video can show the choices made by the involved drivers (and whether those choices were correct or not). And, video can play into the issues of bias previously discussed. Motorcycle accident injuries can be serious. Motorcycle claims can be difficult. When we handle a claim, we begin preparing the case for our client immediately. We investigate. We study the case and the client. We develop the claim. We prepare for trial. Throughout the process, we understand the issues which make these cases unique.